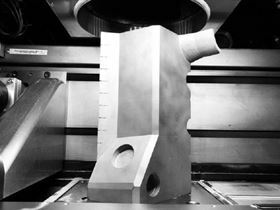 Additive manufacturing (AM) technology developed by University of Birmingham, UK, Stockholm University, Sweden and Zhejiang University, was reportedly able achieve exception levels of both strength and ductility when compared to counterparts from more conventional processes. Researchers were able to optimize the process parameters during 3D printing stainless steel to achieve the results. In most metal 3D printing processes, products are directly built up from metal powders, which can make it susceptible to defects, thus causing deterioration of mechanical properties. This has been made possible due to an ultrafast cooling rate, estimated to range from 1000°C per second to 100 million °C per second, something that was not possible in bulk metal production process until the emergence of 3D printing, according to Dr Liu. Metals that are cooled down so quickly result in a so-called non-equilibrium state, allowing for some amazing microstructures like the sub-micro-sized dislocation network -- which was revealed in this paper to be the main reason of the improved mechanical properties. This story is reprinted from material from the University of Birmingham, with editorial changes made by Materials Today. The views expressed in this article do not necessarily represent those of Elsevier.